There are many elements that make plant cells unique. The following is an overview of their general features. Plants vary though, so other features may be present in certain other species. The cells have a cell wall, something that animal cells do not have. This wall gives support and protection for the plant. The wall can connect with other cell walls for formation purposes. The membrane in the walls determines which substances can get in or out. The cells also have a fluid filled vacuole; this is responsible for giving the plant its shape. The cells contain structures called organelles. The cytoplasm is the component inside the cell that encompasses the organelles. In terms of composition, the cytoplasm is a lot like jelly. The nucleus functions as the control center and is all around the membrane. Another organelle is the centrosome. This is where the cell division (mitosis) starts. The Golgi body is situated near the nucleus and sends out substances from the cell. The rough endoplasmic reticulum is made of sacks and the smooth endoplasmic reticulum is comprised of tubes. The endoplasmic reticulum assists in cellular transportation. The ribosomes aid in making protein. The amyloplasts keep the starch needed by the plant cells. 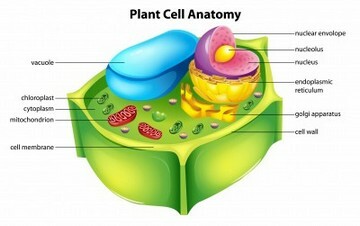 The following are the major components of the plant cell wall. The cellulose is a linear chain of glucose polymers composed of hydrogen bonds. The glucose chains make the cell strong. The cellulose molecules make polysaccharide units known as pectin. These make up the protection of the cell wall. The primary wall is a thin layer that houses the cell as it gets larger. The cellulose is kept in the primary wall. The secondary cell wall is within the primary wall. A compound known as lignin makes the plant stronger. The secondary wall adds more support for the plant. They also shield the plants from bacteria. The middle lamella is comprised of pectin compounds. Inside the middle lamella are intercellular communication compounds. They come with conduits (the plasmodesmata) that permit plants to share important resources. This also helps in the movement and facilitation of vital nutrients. The plasmodesmata make pathways allowing the cells to share molecules. The plasmodesmata also extend from the primary to the secondary walls by linking the cytoplasm of one cell to another one. Photosynthesis is a major cellular function. The plant soaks in sunlight, carbon dioxide and water. These are changed into energy and oxygen. To be more precise, the chlorophyll generates oxygen and sugar from water and carbon dioxide. The chlorophyll is also responsible for the green pigment. Chlorophyll is contained in the chloroplasts. Energy production is also helped by mitochondrion. Mitochondrion changes energy in glucose into ATP (adenosine triphosphate). This is the energy kept in plants made during photosynthesis. The various types of plant cells and their functions show how complex plants can be. The cells perform specific roles and together they work as one to make the plant healthy.